I WANT TO USE MY HOME OFFICE AGAIN! Marilyn had unexpected health issues for years. She had to take a leave of absence from work. During that time she was unable to keep her home office under control. When her condition finally improved and she was ready to get back to work as a consultant, her goal was to make the roomy private space she’d previously enjoyed as an office, functional once again. 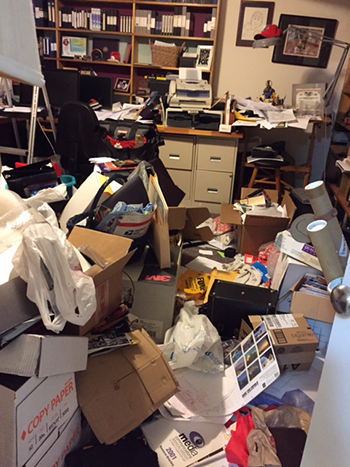 The project wasn’t simply to get rid of everything because there were very important documents mixed in with unimportant items. Step 1: Donate bags were filled with easy to decide on/easy to see DONATE items that filled the packed hallway (not shown in the picture.) Marilyn had clothing, bedding, gift items for children, purses, luggage, office supplies, and books. This part of the project involved a lot of decision making. Step 2: Boxes were set up along the hallway and labeled. There were many categories of items that were buried amongst the papers that got donated in round two. 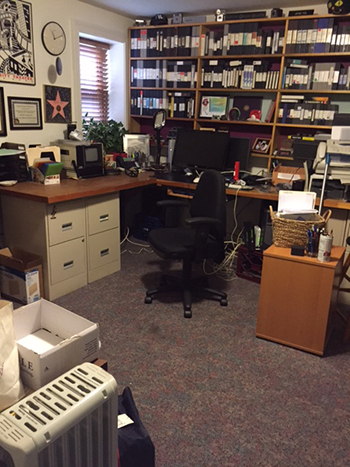 We discovered more office supplies, gift cards, personal and work memorabilia, tools/hardware, electronics. Marilyn wanted to review items she wanted to keep and felt good about donating vs. throwing items in the trash to keep useable items out of landfills. 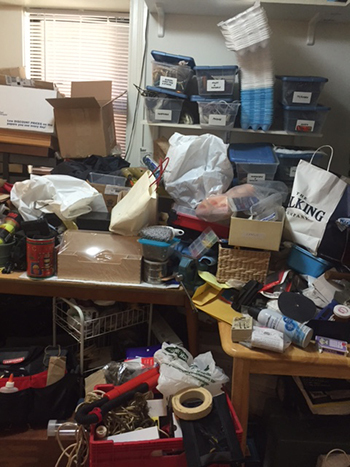 This part of the project involved pulling items out from all corners of the crowded home office and sorting them into the boxes labeled by category. Step 3: Large boxes were discovered containing vast amounts of old mail, important work documents, sensitive documents to shred, work and personal memorabilia all mixed in together. This was the bulk of the project as there were probably 10 or more large boxes of papers/items that needed to be sorted for Marilyn’s review. We lugged out the boxes into the now cleared out hallway and used the same method with labeled boxes by the various paper categories we discovered. 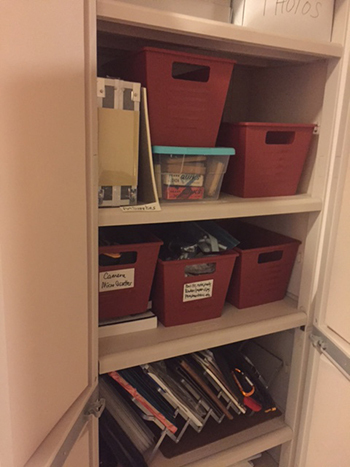 This part of the project involved a lot of sorting and then Marilyn’s review to keep (and then ultimately put in binders or file in cabinet or bankers’ boxes), shred, recycle, or trash. Step 4: Craft/project area also needed a lot of sorting; then decision-making about keep/donate/trash. And Marilyn had easy to put together cabinets with shelves and doors installed in the hallway so items had a place to live. The red tubs contained various categories of items including camera/video, office supplies, small computer items/software, electronics. Please be realistic that it does take more time to accomplish this type of organizing project since each and every paper needs to be looked at in order to make a decision as to its necessity. This story had a happy ending as Marilyn’s home office was once again useable. And the weight of the overwhelming project she felt for years was finally lifted.